This morning we will visit the Panchen Lama's Tashilhumpu Moanastery, and continue on our drive to gyantse (90 Kms) - is a pastoral town between Lhasa and xigatse. It is 264 Kms. southwest of Lhasa, and still retains the charm of a traditional Tibetan town untouched by modern expansion. As a crossroad on the principle trade route to India, it used to be renowned for the excellence of its carpets. The compound, encircled by on impressive wall, once contained 19 monasteries, presided over by the still intact fortress perched atop a nearby mountain. 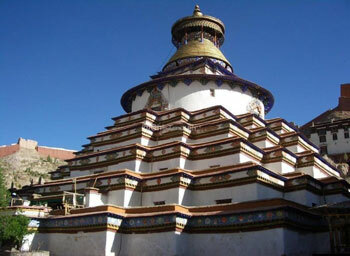 Later in the day visit the Kumbum Stupa and Phalkor Monastery. Overnight stay at the Hotel.